Mr. James Feathers, 98, of Raleigh died Sunday, September 24th, 2017 at home. He was born on June 14th, 1919 in Brooklyn, NY to the late James Feathers and Rose DeRoever Feathers. He was a member of the St. Raphael Catholic Church. He is survived by: a son, Gordon Feathers of Danbury, CT; a daughter, Mrs. Evelyn Dalton of Raleigh, NC; nine grandchildren and nine great-grandchildren. He was preceded in death by his beloved wife, Charlotte Mushacke Feathers, who died in 1999, and his son Bruce J. Feathers who died in 1995. 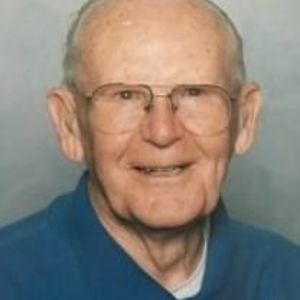 He was a World War II veteran and served in the Army from February 1942 to January 1946. He worked at Burroughs-Welcome for over 43 years eventually serving as their comptroller. He was a lifelong fan of baseball and hockey passionately rooting for the NY Yankees, NY Rangers and Carolina Hurricanes. He was a beloved father, grandfather and great-grandfather who overwhelmingly blessed his family. Enjoying beach vacations every year at Topsail, NC, James Feathers will be truly missed by all. A Mass of Christian Burial will be celebrated at 12:00 on Wednesday, September 27, 2017 at St. Raphael Catholic Church. Entombment will be in Raleigh Memorial Park Mausoleum. The family will receive friends from 7 to 9 pm on Tuesday at Brown-Wynne Funeral Home, 1701 E. Millbrook Road. A Prayer Service will be held at 8 pm. The family will also receive friends at 11:00 am St. Raphael Catholic Church preceding the Mass. In lieu of flowers, contributions may be made to St. Raphael the Archangel Catholic Church, 5801 Falls of Neuse Road, Raleigh, NC 27609.